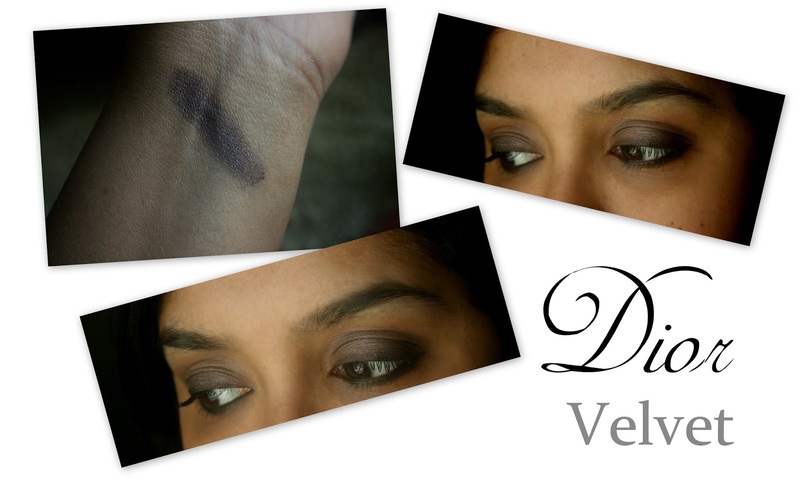 Dior Diorshow Mono Eye Shadow in Velvet ($29) is a murky, blackened plum with hints of warm brown. Its a gorgeous neutral to me, with just the right amount of shimmer that doesn't stand out too much, making it very wearable on a day to day basis. The core collection of the Diorshow Monos have some very beautiful neutrals. Velvet is a complex shade that leans more plum or brown depending on your skintone. On me, it leans plum with hints of brown. It has multi colored, extremely finely milled shimmer that translates to a gorgeous sheen. Velvet feels smooth to the touch and has a super soft texture, but it can get a tad dry while blending - this seems to be the case with the few monos I have tried. They can be used both dry or damp, but I prefer using it dry. It seems to blend better that way. But if you want to pack on a little more color, I would recommend using it over a damp base, rather than taking a wet brush to the pan. Velvet is pigmented enough to show up as it is and sheers out quite well for a soft wash. Overall, amazing color, beautiful, luxurious packaging and nice texture - I wish it was just a tad less dry while blending out. Have you tried the Dior Diorshow Mono Eye Shadow in Velvet?